Situated in Hermanus, The Marine is perfectly positioned for a variety of gastronomic experiences in the Overberg region – from farmer’s markets and wine estates, to regional dishes and glorious seafood. Your culinary adventure begins at The Marine, where Executive Chef Peter Tempelhoff has created a restaurant offering that showcases the impressive bounty of the Overberg. At Origins at The Marine, diners can expect dishes incorporating traditional South African elements in a relaxed, contemporary atmosphere. Traveller’s tip: Ask to pair your meal with a local Chardonnay or Pinot Noir! The Overberg is a wine-rich region, and The Marine’s position offers easy access to explore the wine estates of Walker Bay, Hemel-en-Aarde and the Elgin Valley. The wine estates in the Hemel-en-Aarde region are famous for world-class Chardonnay and Pinot Noir, among many other varietals. The wines and beautiful scenery are matched by a smattering of unique eateries, including both country cooking and fine dining. Try Mogg’s Country Cookhouse, a quirky farm cottage that offers farm-fresh cuisine, or opt for a chocolate and wine pairing at Creation Wines. Traveller’s tip: The Hermanus Wine Route provides a downloadable map of the wine farms in the area – find it here to help you navigate your way. There is also a host of regular markets for foodies and families alike, stretching from Hermanus to the hamlet of Stanford. 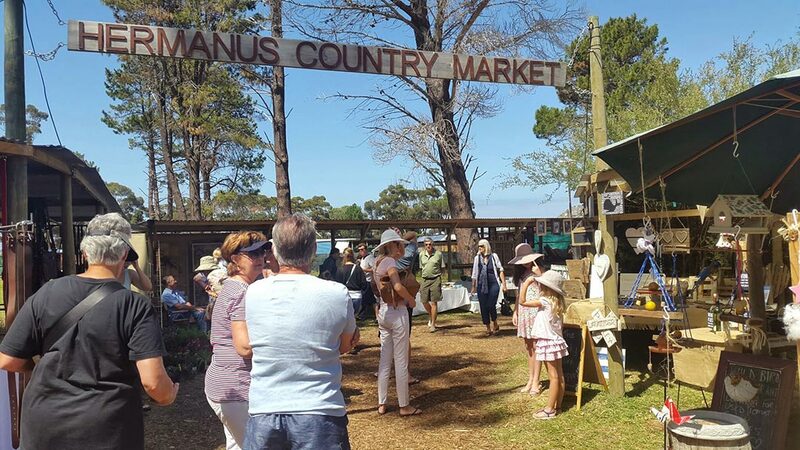 Every Saturday, at the Hermanus Country Market, visitors can sample local craft beers and wines, meet artisan producers and relax with an excellent cup of coffee and a fresh pastry while watching their kids play. There is so much to explore in the surrounding areas, too, such as the award-winning South African Gruyere cheese at Klein River and the delicious craft beer at Birkenhead Brewery. Traveller’s tip: The Birkenhead Honey Blonde is absolutely delicious paired with something spicy – you might want to think about taking a few bottles home with you!